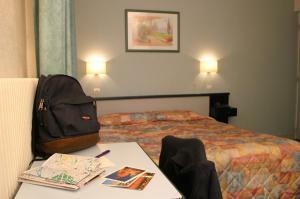 Located 900 metres from Porte de Versailles Exhibition Centre, Printania Porte de Versailles features a 24-hour front desk, luggage storage and room service. 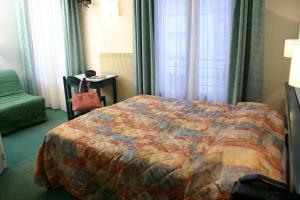 All rooms at the hotel feature a TV with satellite channels, a desk and a telephone. The en suite bathrooms are equipped with a bath or shower and a hairdryer. A continental breakfast is available and the hotel is ideally located close to numerous restaurants, supermarkets and shops. Wi-Fi access is available at an extra charge. Convention Metro Station is just a 5-minute walk away and gives direct access to Gare Montparnasse, la Concorde, Saint-Lazare and Montmarte. Free Wi-Fi access is available in the public areas and parking is possible at a location nearby. This room features a TV with satellite channels, a desk and a telephone. 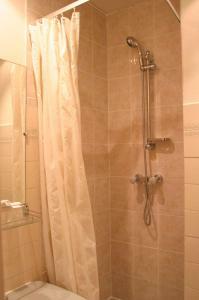 The en suite bathrooms are equipped with a bath or shower and a hairdryer. 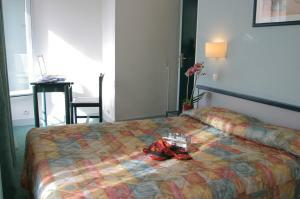 Rate: € 70.00 ... € 176.00; select dates below to get current rates. Rate: € 129.58 ... € 130.22; select dates below to get current rates.